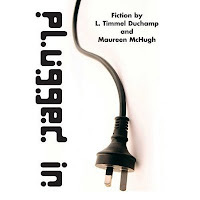 According to the back cover, Plugged In was "published in conjunction with the appearance of L. Timmel Duchamp and Maureen McHugh as the Guests of Honor at Wiscon 32", which is fairly cool because if not for that fact this chapbook might otherwise never have existed and the two stories here never would have been put together. "The Kingdom of the Blind", from Maureen McHugh is original to this collection while L. Timmel Duchamp's "The Man Who Plugged In" was first published in 2006's re:skin (the story itself has a copyright date of 1998). "The Kingdom of the Blind" opens this chapbook with a story of a weird systems burp which causes power outages across medical facilities linked by SAMEDI, which is a program running on the BHP DMS software system. This sounds overly techy, like something written by Charles Stross or occasionally by Cory Doctorow, but while there is tech-talk in "The Kingdom of the Blind", the story is not overwhelmed by it. "The Kindgom of the Blind" is driven by Sydney, one of the members of the IT team at DM Kensington Medical. Sydney and her team attempt to find out why the glitch is occuring every day at the same time and impacting all of the hospitals running SAMEDI and doing so in a particular order. While "The Kingdom of the Blind" begins with a simple tech SF story of figuring out a problem with a computer system, the story turns into a moral question. If a computer system has someone developed sentience and is aware, is there a moral issue involved in shutting down the system and restoring an earlier, more unaware backup and thus effectively "killing" the AI? Maureen McHugh doesn't offer a simple answer. In the end Sydney makes her decision, but "The Kingdom of the Blind" does not truly offer commentary on the morality of her decision. The story just asks the question. "The Kingdom of the Blind" takes all sorts of ideas internalized by a generation raised on The Terminator and various aspects of artificial intelligence in science fiction and without getting anywhere near the doomsday scenarios which normally cover the concept, McHugh asks the reader to think about the morality of how humans should interact with sentient computer systems and what our resonsibility is. Oh, and she tells a good story, too. L. Timmel Duchamp goes another direction with "The Man Who Plugged In". The focus is still on technology (hence the title of the chapbook), but on a more human level. Technology has advanced to the point where women can give birth to a child but actually carry the fetus outside of her body in an external carapace, a "prenatal cradle of caring" designed to offer "better care and protection than any naturally gestated child". Howard Nies is a pioneer. Howard is to be the first male to carry a child in an external carapace. All that is needed is a couple of major surgical procedures to take the womb from his wife so he can carry the child. The story follows Howard as he goes through hormonal and physical changes and becomes obsessed with the child he is carrying. The story follows the impact on Howard's marriage. Besides following the timeline of the pregnancy, Duchamp throws in sidebar quotes from various future medical journals regarding what the procedure entails. There is the obvious flipping of gender roles in the pregnancy (perfect for a feminist science fiction convention like Wiscon), and this is truly what is at the core of "The Man Who Plugged In". The story examines the obsession of Howard Nies through the pregnancy and later in the story it is revealed that his wife only just went along with the deal because he really wanted it. This is a flip of what could be considered a more traditional story of pregnancy, the wife who really wants a child and gets herself pegnant even though the husband didn't really want a child. Or, perhaps a flip of the husband who gets his wife pregnant even though she really didn't want to carry the child. Either one. Either way the story is interesting, but when viewed as simply flipping a more conventional tale of family while adding future tech, "The Man Who Plugged In" is nothing revolutionary. It takes the trappings of science fiction to tell a fairly straightforward story. On the other hand, "The Man Who Plugged In" is still an interesting story. It does rely (and stand) on being a "male pregnancy" story, but Duchamp is a good enough writer to pull off the story. Plugged In contains only two stories, but the stories here are both good (the McHugh is better). A two story collection would not normally be enough to recommend picking it up, and in that sense, the value might not be there, but these are two good stories. Plugged In is a limited edition publication that looks at the future of technology, both on a computer level and on a human level. This is a forward looking collection, which is ultimately what science fiction is supposed to be about. It's worth the time, even as a two story chapbook of a collection from two excellent authors. The stories may not be perfect (what is? ), but despite flaws and limitations, there is good stuff here. Reading copy provided courtesy of Aqueduct Press.